Over the past few years, routine laboratory Homocysteine (HCY) testing has begun to move away from the mainframe immunoassay analysers onto clinical chemistry platforms. Axis-Shield has been at the forefront of this change with the Liquid Stable 2-Part Homocysteine Reagent. The Axis-Shield Liquid Stable 2-Part Homocysteine Assay is a next-generation 2-Reagent assay offering superior performance and stability. The Liquid Stable (LS) 2-Part Enzymatic Homocysteine assay is intended for in vitro quantitative determination of total homocysteine in human serum and plasma. In the Axis-Shield Liquid Stable 2-Part Homocysteine assay, bound or dimerised homocysteine (oxidised form) is reduced to free homocysteine, which then reacts with serine catalysed by cystathionine beta-synthase (CBS) to form L-cystathionine. Cystathionine in turn is broken down by cystathionine beta-lyase (CBL) to form homocysteine, pyruvate and ammonia. Pyruvate is then converted by lactate dehydrogenase (LDH) to lactate with NADH as coenzyme. The rate of NADH conversion to NAD is directly proportional to the concentration of homocysteine. Pack sizes to suit your usage: available in 100, 200 & 1000 test formats. 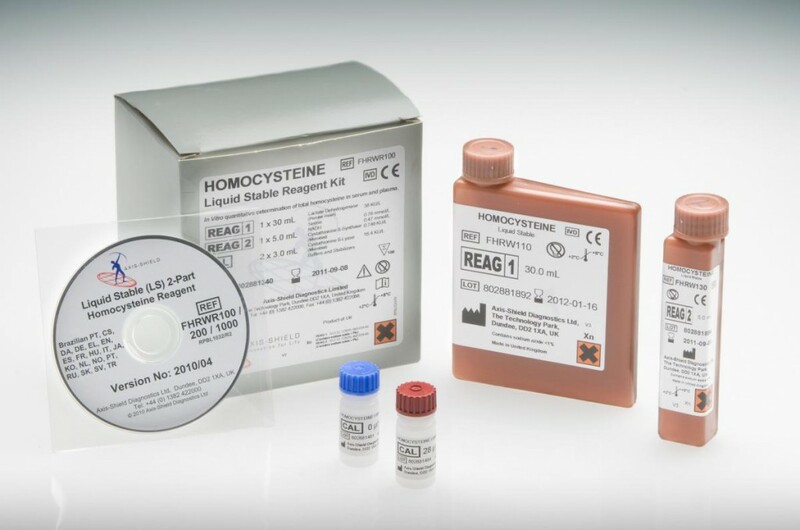 If the Homocysteine concentration of a sample exceeds the range of the calibration curve, the sample should be diluted one part specimen with two parts Cal 0µmol/L (provided in the kit) and be reanalysed. Please visit www.axis-shield.com for information or Click Here to download our brochure.